P22 Type Foundry in association with Virgin Wood Type announces the release of a completely new wooden version of the Czech Modernist font, Preissig Scrape. The bold expressionistic design is offered as a wood type font to letterpress printers and collectors. 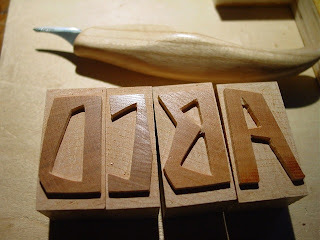 Virgin Wood Type Manufacturing Company is dedicated to making wood type using traditional techniques and a few updated/improvised methods and is located in Rochester, NY. To learn more about Virgin Wood Type, order the font or to see the process in greater detai, click here. The digital version of Preissig Scrape and the Czech Modernist font set will be available from P22 Type Foundry at a 25% discount for the month through March 31st, 2011. Click here to go the Czech Modernist page.